The farming of mink was pioneered in the USA more than 150 years ago, during the Civil War, at Lake Casadacka, New York. The first attempts to raise mink in Canada were recorded in the 1870s, by the Patterson Brothers, in Richmond Hill, Ontario. Though originally taken from the wild, after more than 100 generations (more than 2,000 human years) farmed mink are now considered to be a domesticated animal. Through careful selective breeding, North American farmers have developed a wide range of beautiful, natural fur colors. Farmed mink are, in fact, quite different than their wild cousins. They are considerably larger and tamer. More information on mink biology, behavior, range, reproduction. Farmed mink is the single most important fur type produced in North America today, in terms of the number of pelts produced and the value of the fur. 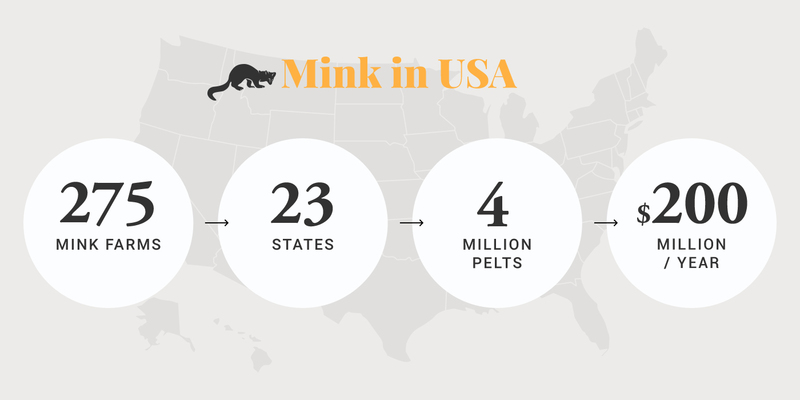 In the United States, there are some 275 mink farms in 23 states producing about 4 million pelts annually, with a farm-gate value of more than $200 million. Wisconsin is the leading mink-producing state, generating well over 1 million pelts. Other important producers are Utah, Idaho, Oregon and Minnesota. 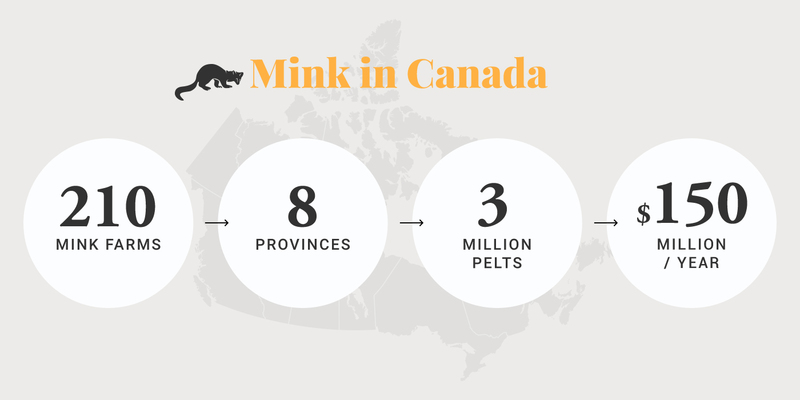 In Canada, there are currently some 210 mink farms producing more than 3 million pelts annually worth $150 million. About half of these mink are raised in Nova Scotia. Other important producers are Ontario, British Columbia, Prince Edward Island, Newfoundland and Quebec. The need to provide farmed mink with a comfortable and stress-free environment, clean water, balanced diets, and overall good health remain the same year round. But some important activities change with the seasons.